Even witches like scary movies. We see Emma Roberts as a witch with a patent black witch hat, ribbed knit polo shirt tucked in a front buttoned denim skirt and black leather loafers completed with Louis Vuitton miniature golden bag. Love her long straight hairstyle and natural makeup. 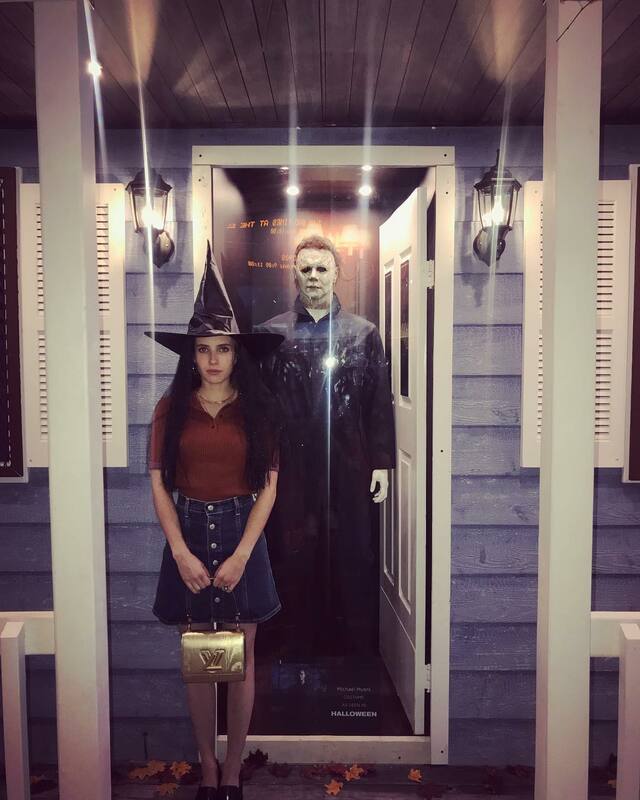 She stands in front of Halloween movie costume. Do You have any thoughts about Emma Roberts As A Witch With Long Straight Hair? Here are Instagram Fashion pictures and trendy women’s outfits which are in style in 2019: Buttoned Skirts, Denim Skirts, Emma Roberts, Golden Bags, Halloween, Knitted Polo Shirts, Long Straight Hairstyle, Witch Hat and tips on how to wear them on the streets.